Bob’s will be donating a portion of every helmet sale TODAY thru July 6th to the Claudia Mayer Cancer Resource Center in Howard County. 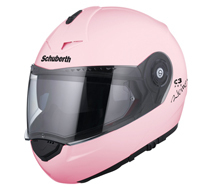 $50 donation made with the purchase of the NEW Schuberth PINK C3W Pro helmet. $25 donation made with the purchase of ANY in-stock helmet. Shop Online or visit Bob’s today!